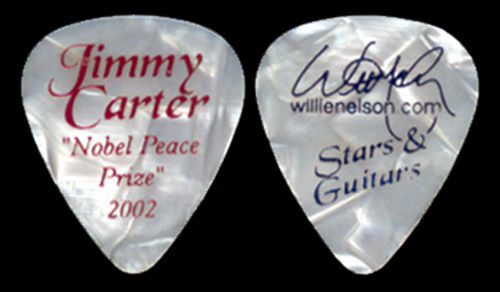 On December 8, 2004, “CMT Homecoming: Jimmy Carter In Plains” premieres, featuring a Willie Nelson concert, taped in the former president’s hometown. 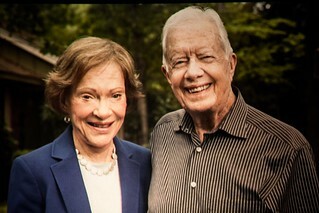 The concert was filmed in September, for a special airing in December 2004, when CMT featured a special homecoming event, with the 39th President of the United States, Jimmy Carter, for an intimate look at the small town that he still calls home and where he spends the holidays with wife Rosalynn, his children and grandchildren – Plains, Ga. 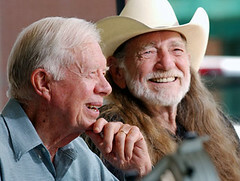 In this one-hour documentary, CMT Homecoming: President Carter In Plains, President Carter welcomes his longtime friend, country legend Willie Nelson, to Plains for the reunion. 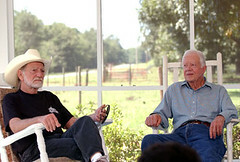 Nelson joins President Carter for a tour of his childhood home, his boyhood haunts, and the town that holds a special place in President Carter’s heart. The two friends swap stories of what it was like growing up in small towns and reminisce about their friendship that has lasted decade. 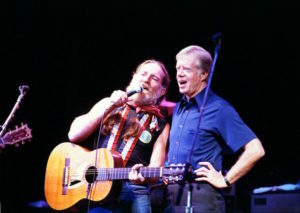 In honor of Plains, Nelson performs for everyone in the town, and the fans get a surprise when President and Mrs. Carter join Nelson on stage. Thanks to Alice from Georgia for sending pictures. 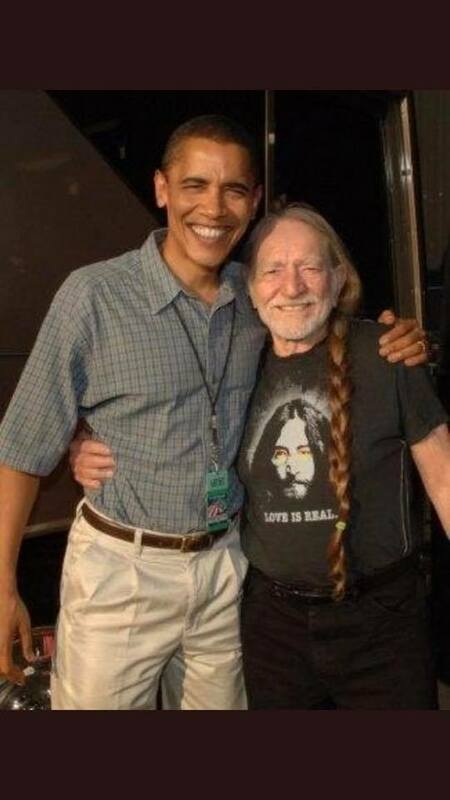 According to Willie Nelson’s longtime road manager, David Anderson, this is what it looks like when the President of the USA walks in unexpectedly after the show while you’re smoking a joint. 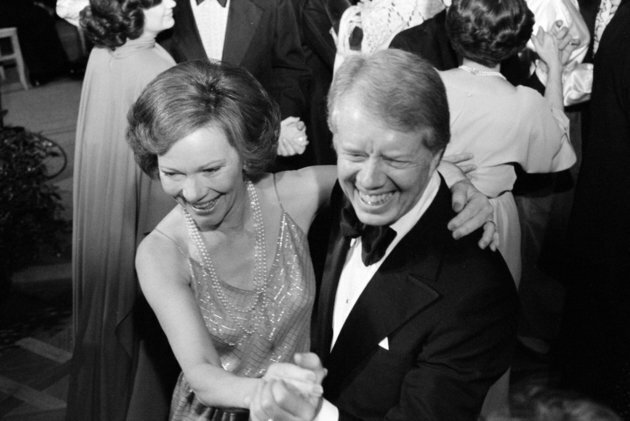 Although we regret we couldn’t be with you today, Rosalynn joins me in congratulating you on receiving the Library of Congress Gershwin Prize, a prestigious and well-deserved award. Your music has enriched the lives of people far and wide for decades, and it is only fitting that your life’s work be honored in this way. 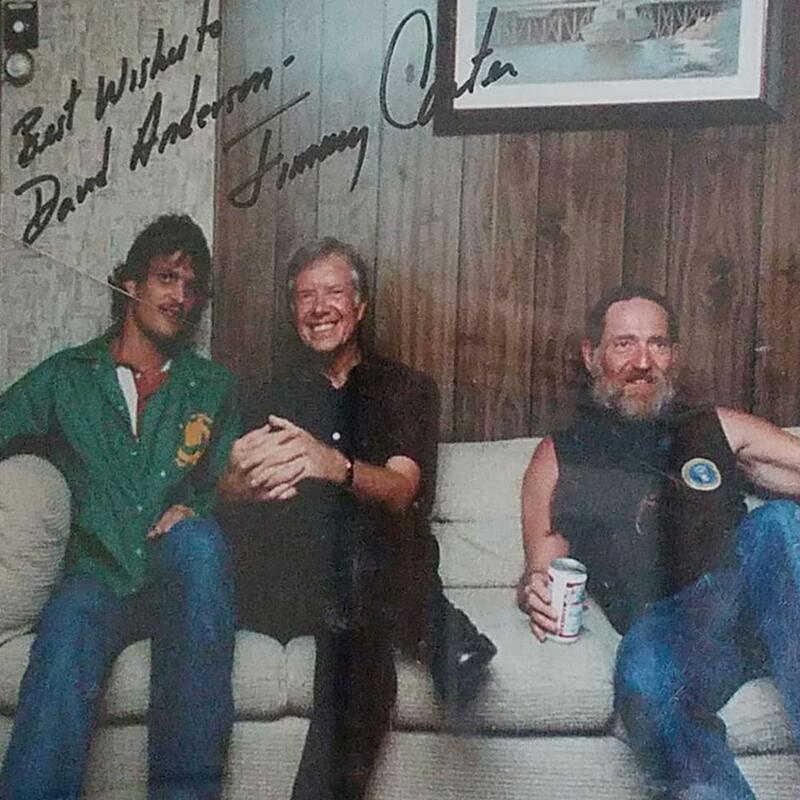 Your friendship has been important to us for over 30 years, and we were proud to host you at the White House and in Plains. We also loved having you in Oslo for the Nobel Peace Price concert in 2002. 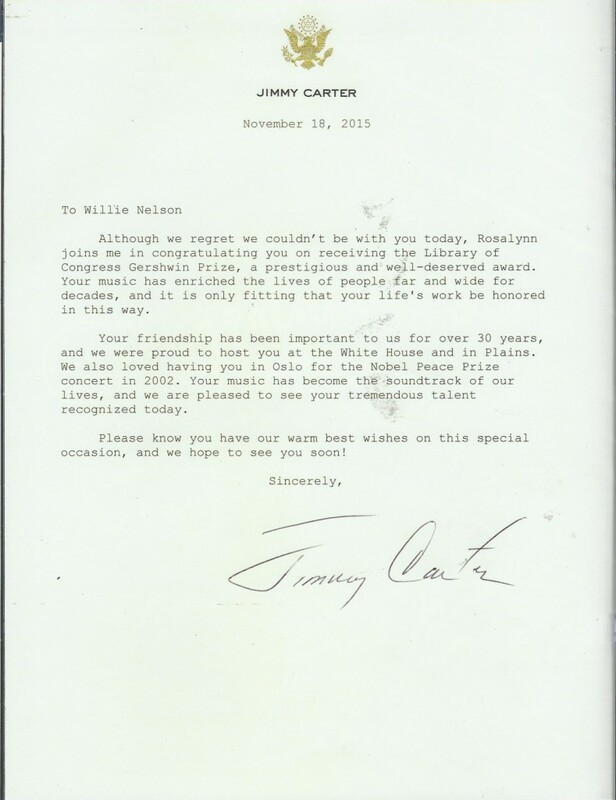 Your music has become the soundtrack of our lives, and we are pleased to see your tremendous talent recognized today. Please know you have our warm best wishes on this special occasion, and we hope to see you soon! 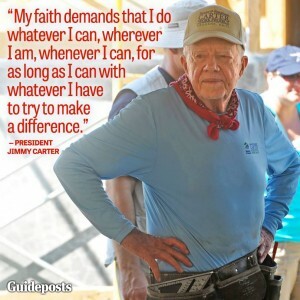 Happy birthday to President Jimmy Carter, born in Plains, Georgia on October 1, 1924. 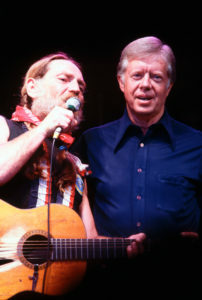 President Jimmy Carter joins his friend Willie Nelson on stage for a song during a concert appearance by Nelson at Merriweather Post Pavilion in Maryland. Carter was in the midst of his campaign for a second term as President. Jean Parker has accumulated an impressive collection of stories over her years working at Merriweather Post Pavilion. She joined the staff in 1977, now serves as the venue’s general manager, and can recall watching President Jimmy Carter join Willie Nelson on stage to sing “Georgia On My Mind”, or that time when a mix-up resulted in her having to pick up Depeche Mode from the airport in her family minivan. However, one memory stands apart from the rest. 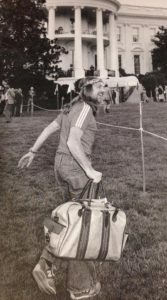 “The Grateful Dead story is the number one story,” Parker said in a recent interview with DCist. The Dead came to Merriweather in 1985. In those pre-Internet/cellphone days, it was hard to get the word out about day-of sellout concerts. Seven thousand ticketless fans showed up and the staff had to work alongside the Howard County Police Department to find a way to handle the crowd. Step one: Reduce the price for lawn seats from $12.50 to $10 for the sake of efficiency. Step two: Set up makeshift box offices consisting of a staffer on one side of the fence and the fans on the other side. After collecting the money, venue employees or police officers would help attendees jump over the fence. 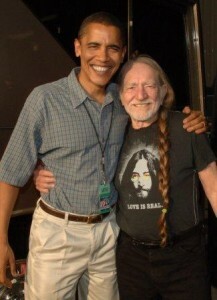 The 50th anniversary bash takes place on Saturday and features Jackson Browne and Willie Nelson. Merriweather Post Pavilion was a central component to James Rouse’s vision for Columbia, Md., one of the the country’s first fully planned suburbs. Rouse expected the amphitheater, designed by Frank Gehry, to be an arts center that would showcase orchestras, ballet, and opera. The venue at one point served as the Baltimore Symphony Orchestra’s summer home, but the pavilion struggled in the early days. Opening the doors to rock and pop concerts put it on firmer footing. Jimi Hendrix, The Who, and Led Zeppelin all played Merriweather, including the only time the the latter two ever shared a bill. Jimmy Buffet made the shed a home-away-from home and has played there more than any other act. Despite a rich history (read The Baltimore Sun’s excellent account of MPP’s early years), Merriweather fell on hard times as the 21st century began. In 2003, development plans threatened to close the pavilion, which resulted in a successful Save Merriweather campaign. The pavilion got an additional boost in 2004, when I.M.P., the Seth Hurwitz-run company behind the 9:30 Club, Lincoln Theatre, and the soon-to-come The Anthem, started booking acts there. Ownership of the venue recently transferred to the Downtown Columbia Arts and Culture Commission, a non-profit whose executive director, Ian Kennedy, was a driving force in the Save Merriweather effort. The DCACC hopes to expand the programming at Merriweather to include movie nights, the return of orchestras, speaker series, visual arts displays, and other types of events that need not turn a profit so long as costs are covered through the DCACC’s funding apparatus. Credit for Merriweather’s rebound must also go to to I.M.P. and the ethos it brings to all of its endeavors. This has allowed the company and the amphitheater to thrive as independents in a concert industry that national corporations dominate. I.M.P. recently signed a 40-year lease on Merriweather, which allowed it to invest heavily in upgrades. The $60 million effort includes a rotating stage for festivals, improvements to the amphitheater itself, additional parking, and the construction of vast backstage facilities for staff, artists, and VIPs. Most visible to concert-goers is the Chrysalis stage, a smaller platform that takes advantage of Merriweather’s wooded surroundings. Greensky Bluegrass will be the first Chrysalis headliner on July 22. While Merriweather Post Pavilion’s ownership and partners are taking concrete steps to move into a prosperous future, its success will largely hinge on the sound decision making of its past. Correction: A previous version of this article indicated that I.M.P. had signed a 50-year lease with Merriweather Post Pavilion. The story has been updated to reflect that I.M.P.’s lease is for 40 years. Merriweather Post Pavilion’s 50th Anniversary Concert takes place on Saturday, July 15, with Jackson Browne and Willie Nelson. Father John Misty opens the show and Grace Potter hosts the event. 6 p.m. $55-$125. Former President Bill Clinton turns 70 today. 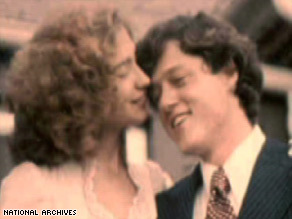 AUSTIN, Texas (CNN) — Garry Mauro will never forget that night in 1972 when he says Bill Clinton and Hillary Rodham ignored the post-election party surrounding them, instead preferring to huddle in a corner and talk about changing the future. Mauro recalls the night it was all over in 1972, after Democrat George McGovern lost to Republican Richard Nixon. 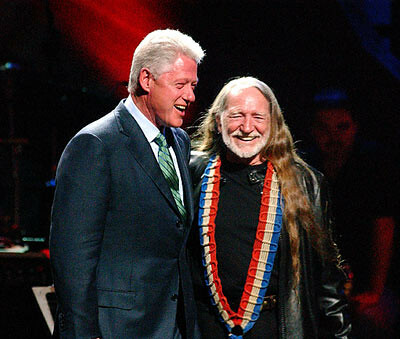 He says he and the Clintons decided to let loose in lively Austin, paying $1.50 to see a Texas singer by the name of Willie Nelson before rambling back to a colleague’s tiny apartment.